Ustream, Livestream, We All Stream! Real Raw Media Direct From the Streets. The New News is at your fingertips. If you’re wondering what the ongoing “occupy” movement is doing and have noticed that mainstream media news isn’t clearing up any confusion but adding to it instead, don’t despair. There is a cure–it’s the news coming direct and live from the streets of America, London, Greece, Ireland, Canada and around the world. This is not objective, nice or neatly packaged media footage that has been edited to fit a television time slot. It’s real-time with real people dealing with real issues. There are no professional talking heads in this new news media. But there is often plenty of talk to be had–good, bad and ugly all swirling together in a stew of information unlike anything on your television. The people who bring this news online are not suited or hairbrushed fashion plates. Personal imagery is not their priority. Catching the action and information as it comes down the pipe is their goal. No one is paid. These are volunteer journalists from the grassroots. It’s not all 24/7. It’s not pretty. It’s not spin. It’s just what’s happening folks. Often it’s downright messy. Sometimes the police get violent. Tim Pool of “we are the other 99%” tirelessly follows the occupy action on the streets of New York City. Appreciative local NYC viewers bring him umbrellas, gloves, food and coffee while he is on a streaming mission with occupy wall street actions. Pool is cool-headed, gives good commentary, has a great eye for the scene and seems to have the endurance of a marathon runner. Oakland is also livestreamed at http://www.livestream.com/occupyoakland by the one and only Jahrastafari and/or legind. And OakFoSho’s ustream is also featured. Most Occupy locations have their own media livestream crews: Seattle, Toronto, NYC, Portland, Nashville, London, Auckland, Los Angeles et al. And each one has its very own flavor. This is real diversity in media. On the morning of Oakland’s first raid in Oscar Grant Plaza the ONLY news coverage of any kind came from Punkboy streaming via his phone. His efforts got him into the press conference held that day where even the mainstream press tried to ask hard questions like “How is Oakland going to pay for all this police action?” The reply was less than adequate. Those of us who watched that morning thank Officer Bolton for finding Punkboy on the street outside city hall and getting him into the not open to the general public press conference. In Dublin, Ireland currently one man, Irelandseyes, does marathon livestreams from Dame Street. From the Occupy camp that kettles the Central Bank come scenes of the street, marches, music, and endless talk of the Irish. So far the gardra and local businesses have been very good to Occupy Dame Street. Even the security garda in the 24/7 McDonalds, Moses, has been willing to greet the livestream chatters while Irelandseyes “recharges.” Other Irish occupy camps are in the process of setting up livestreams and ustreams: Cork, Waterford, Galway, Tipperary. Travel across the states and europe without enduring TSA. What can I say? Olbermann is just so good at scoring direct hits that it’s downright spooky. Who is occupying whose mind here? Olbermann mine or me Olbermann’s? It doesn’t really matter because the bottom line is that we’re on target when it comes to The Billionaire Bloom of New York City and his handling of the Occupy Wall Street movement. 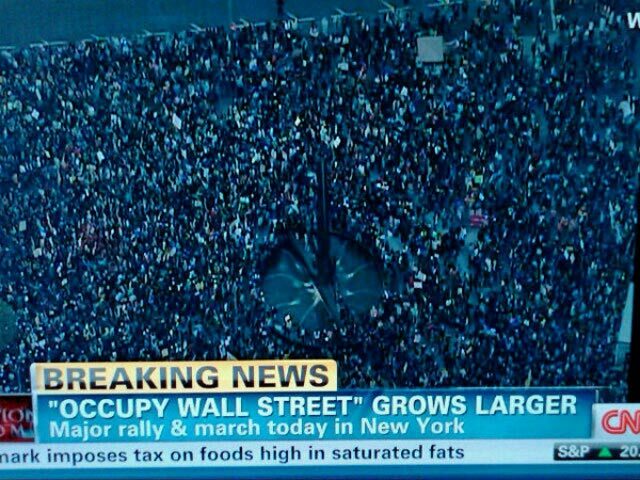 Heck, even NPR said at one point that it wouldn’t cover OWS unless there was violence involved. Gee, that must have been Mayor Bloomberg’s cue card to show his secret support for the people pointing fingers at the folks who destroyed the economy. Nothing else makes sense, does it? Why else would The Bloom march out New York’s finest to deal with peaceful protestors every chance he gets? With every confrontational step he takes, The Bloom aids and abets the very folks certain big banks want to banish into the pits of debt slavery of all ilks. A huge round of applause is due The Bloom for preventing the occupiers from becoming complacent in Liberty Park and encouraging everyone into the streets. According to one NYPD estimate 32,000 people accepted the mayor’s latest invitation to stomp through the streets and across the Brooklyn Bridge. Kudus to The Bloom for revealing the very uncomfortable reality of the world in which we are living. Do you get the feeling something serious is going on here? Just for a moment let concpets of positive social evolution occupy your mind. Just one moment at a time is fine. Really, everyone moves at their own pace–even the one percent like The Bloom. FYI, from the1491s, Geronimo is not dead! Get a view of Tar Sands Keystone XL Pipeline Action–complete with the plastic pipe handlers. The following videos offer video information of the Tar Sands Action at the White House on November 6, the Ottawa action (video just recently posted on YouTube) and an older segment from Democracy Now! which offers an introduction to the issue and the ongoing Indigenous struggle. Approximately 12,000 people surrounded the White House three lines deep–and other buildings to express disapproval of the proposed Keystone XL Pipeline which President Obama can veto all by himself. If you saw live coverage of this protest on your television please post a comment stating which station, where, and when. Much appreciation to the Livestreams of Occupy Oakland and Global for sharing the LIVE Tar Sands Actions video feed with their viewers as soon as they learned of the protest. Thanks to the Occupy DC KSt media team for expanding LIVE coverage of the protest by going mobile with their own equipment. The combined efforts brought the Tar Sands Action viewership to approximately 3,000 people online via the Livestream media. White House being circled NOW, Tar Sands Protest Livestream! View the Protest at the White House Now! What’s Today? Tar Sands Day! — Surround the White House. Stop the Pipeline! It’s November 6, 2011 aka Surround the White House Day to Stop the Keystone XL Pipeline from the Tar Sands. Join the people circling the White House today at 2pm ET by sending a message to President Obama. Apparently our public comments have been LOST. Yep, they’re MIA. Now that’s audacity on the part of whomever “lost” the public’s comments. So don’t wait, use the nifty form on the Tar Sands Action site, call (202) 456-1111, or fax 202456-2461 to lend your voice to this protest of environmental destruction. Will the mainstream media cover this event? Let’s not hold our breath considering the blackout of Oakland’s General Strike and the march of THOUSANDS of people who shut down the port on Nov. 2. If mainstream media has th gall to ignore that massive turnout they’ve definitely got no problem ignoring this Tar Sands Protest today. The Indigenous Environmental Network offers great information on the Tar Sands, the pipelines and Indigenous work to save Mother Earth. Connect with their network today. November is Native American Heritage Month and Earth is common ground for all of us. Discover your place in the web of life. Visit the Indigenous Environment Network by clicking here. It’s November and that means “official” Native American Heritage Month in the US of A. Folks it’s time to get down with the genocidal history of the United States of America. Before the Japanese were sent to camps for being Japanese in America, the Indigenous people were forced onto reservations which I consider prisons without walls. Genocide in America is ongoing to the present for Traditional Indigenous people who have endured the theft of their land and children and destruction of their culture for several hundred years. Columbus Day does not engender warm fuzzy memories for everyone now living in the Americas north, south and in between. We all love movies, don’t we? Think about how films have formed your view of Native Americans and history. Consider how those often called “the losers” view the same events–and the portrayal in films. For those of you who adore the movie “Dances With Wolves” ask yourself why you like the film? And please think about why “the Only Good Indian” never got on the national movie theatre circuit in the United States of America. Yes, you can find it in parts on the tube of you. Time to get beyond stereotypes and into reality.